I am so excited. The Canadian Industry Minister has ruled to allow Globalive's WIND to offer cellphone service in Canada. Yippee! If you go to their website, you immediately see how different they are. They talk about creating an unforgettably positive customer experience. Wow. They have three great commercials on the site too. It will be great to watch them. Go WIND! I recently watched Michael Moore's movie Capitalism. As with all his movies, I was left with a lot to think about. Featured in the movie was Franklin Roosevelt's speech in January 1944. In this speech, Roosevelt proposed a second bill of rights, which was never acted upon. It included 'the right to a useful and remunerative job'. 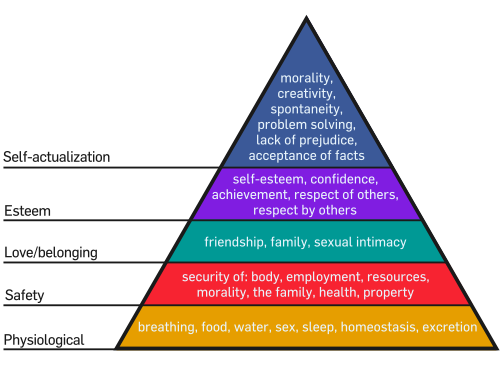 Abraham Maslow's hierarchy of needs includes security of employment as well as security of resources. Thus, Roosevelt's identified right related to a basic human need. And that also explains why the impact of being fired, or laid off, or not having work, is so significant for most human beings. What sense of safety is possible without a useful and remunerative job? I have seen the impact of the lack of certainty. It wears on one's spirit. This recession has been a difficult time for so many. And many whom I talk to carry with them an undercurrent of anxiety even if they have apparent security. A recent Harvard Business Review article spoke to the paralysis gripping organizations, with even those who have not lost their jobs operating at a reduced capacity. The paper recently proclaimed that the Canadian recession has been officially declared as 'over'. There have been small trickles of better news, here and there. I look forward to the increasing signs of a recovering economy. In particular, I look forward to the easing of the strain I see. With so much collective energy directed towards survival, there is not much left for transformational projects. And the talent of so many is much better directed towards transformational projects, than survival. I am re-reading the book Yes! 50 Scientifically Proven Ways to Be Persuasive this weekend. I have never been the type to read a good book only once. I find that I am able to glean new insights each time. This particular book is quite good. It illustrates how small changes can make a big difference. Subtle changes that could help each of us, in a world where it is important to have the support of others to do what it is that we are committed to doing. Chapter 16 packs a punch. The authors speak about the significant additional commitment we feel when we respond to a request with 'yes'. A small shift in how a question is posed, a large shift in commitment. We are far more likely to do what we say we will do. As an example, if we are asked "Will you attend on Saturday?" and respond "Yes", than if we are asked "Please let me know if you will attend on Saturday" and say nothing. This insight has tremendous application in our work and at home. I think about how often I make a request of my kids without phrasing the question such that a response is required, and then waiting for that response. A very subtle change that makes a big difference. The principle also highlights the value of accountability agreements, which require us to explicitly state what it is that we individually will do to further the cause or move the project forward. A key weakness often identified with studies and recommendations lies in the implementation. What might be possible if this awareness was brought into that part of the process?